Dosto Namaskar Aaj ke Ish article me main apko bataunga ki facebook par se profile name kaise hide karte hai,Facebook par se apni profile ka name kaise Chupa sakte hai,Dosto Aapne Facebook par Aise facebook account dekhe hone jinme bas Profile name nahi hota aur Aap Sochne Lage Hoge ki Akhir Yeh kaise Ho sakta hai,Aaj Main Apko Aisi Tricks ke Baare me hi bataunga,Ish Trick ko Use karke Aap bhi apne Dosto ko Impress kar Sakte ho ,Apke Dost bhi Achambhit ho jayenge ke akhir yeh kaise Possible ho sakta hai,Jo Trick main Apko Batane Ja Raha hu Isse Aap Apne Facebook Profile Name ko Hide,Delete or Remove kar Sakte ho Iske Alava aap Apna Single Name bhi Show Kara Sakte ho Facebook par,To Chalo Ab Main Apko Batata hu ki Facebook par apna profile name kaise hide karte hai. Read-Ek Click me sabhi fb friends ko group me kaise add karte hai? Facebook par Apna Profile Name Hide Aap 2 Method me Se Kisi se Bhi Kar Sakte hai Jo Apko Suitable Lagey,Par Apko Dhyan Rakhna Hoga ki In Methods ko Aap Computer/Laptop par hi Use karey. Read- Password Protected Wifi Hotspot ka Password Kaise Pata Karey? Apne Compter or Laptop me Uc Browser open Karey,Uske Baad Apne Uc Browser ki Setting me Jaaye,Ab Proxy Aur Port Setting me Jo Code Niche diya hua hai Isko Add karey. Iske Baad Setting ko Save Kar De. Read-Free mein Website kaise banaye ? Apne Computer/Laptop me Firefox Mozilla Browser ko Open Karey. Ab Aap Apne Firefox Browser me 3 Parllel Line ≡ par Click karo,Ab Options Par Click karey. Ab Advance>Netword>Settings par Click karey. Iske Baad 'Manual Proxy Configuration' ke samne jo box hai ush par click karey. Ab Setting Save Kar De. Read-Android Phone ko Root kaise karey? 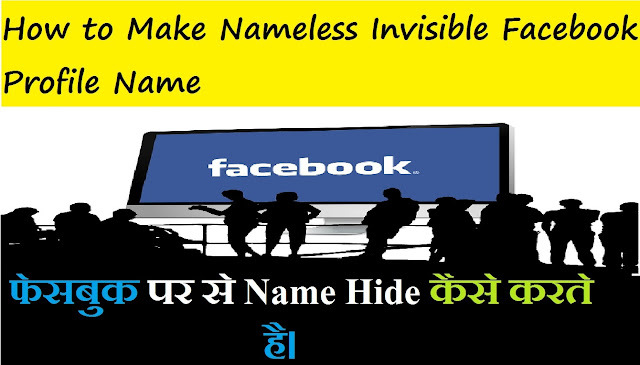 Ab Hamare Browser ki setting Complete ho chuki hai,Ab Aata Hai Hamara Asli Kaam Apne Facebook Profile ke Name Ko Hide Karna ,Jo Niche Steps Diye Hue hai Unko Follow Kijiye aur Apni Fb Profile Name Ko Hide Kijiye. Step 2:-Ab Apni Email ID aur Password Daale aur Login par Click karey. Step 3:-Ab Aap Apne Facebook Account ke Homepage par Aa gaye Ho,Ab Account Setting me jaaye. Step 4:-Ab General par click karey,Ab Language par click karey,Ab Indonesia Language Select Karey. Step 5:-Ab Name Change Setting me Jaaye,Aur First or Last name ko Delete karey,Ab Aap Niche jo Code Diya hua hai Ishko Copy kar lo. Step 6:-Ab Ish Code ko Apne First Name Box me Paste Kar De. Step 7:-Ab Isme se 'k' Latter ko delete kar de,Ab Setting save kar de,Ab aapse Password ke liye Puchega ,Ab Apna Password daale aur Setting save karey. Step 8:-Ab Dobara Language Setting me Jaye Aur Language English Choose karo. Ab Aapne sare Steps Complete kar liye hai,Ab Apna Name Check karey Apka Name Apki Fb Profile me se Hide ho gaya hai,Agar Apka Hide Nahi hua hai to Niche Comment Karey Main Apki Problem Solve Karne Ki Apni Taraph se Puri Koshish karunga. Ummid Hai Dosto Apko Aaj ka Yeh Article Pasand Aaya Hoga,Agar yeh article apko Achha laga ho to Isko Apne Dosto ke bhi sath Facebook,Twitter,Linkedin etc social site par bhi share karey. Read-Google Adsense Team ko Invalid Click Report kaise karey? Read- Youtube par Channel kaise banate hai free me? Read-Google Adsense se Paisa kaise kamate hai? Read-Google Adsense ke liye Apply karne se pahle Apne Blog par karey ye tayyari. Read-Computer par Android Mobile ko Connect karke Internet Kaise Chalaye? Read-Read-fb account ko fb page me kaise convert karey?